Radio Free Deimos E31: Actual Play with Pierce! 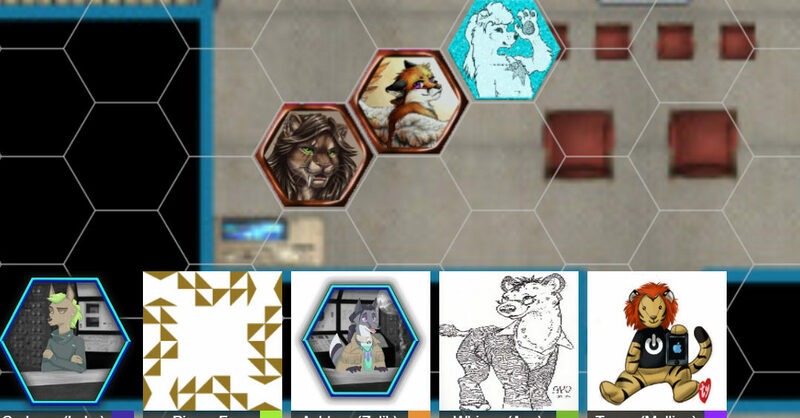 Episode #31, 2.0 Actual Play! Tragically, or tragi-comically, the first half-episode of this game didn’t make it to the recording studio, so there’s a lot of character introduction stuff that’s lost to the winds. Meet the band! Image of Gao Ryuki is owned by his creator and the artist, SabretoothedErmine. 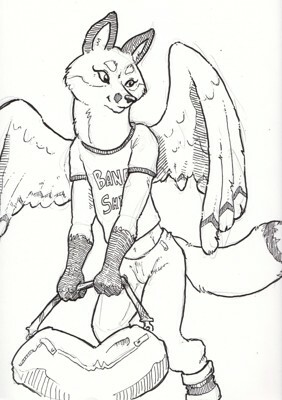 Please lavish praise for this great picture on FA! We do not own this image in any way, shape, or form, but wanted to call it out. Mallion Lyger, played by Tygon (who is a game guide and serious playtester in his own right! His videos are mostly unlisted right now, but you can check out a playtest session of his on Youtube… I’m convinced Mallion is the lead guitarist and one of the two front-line performers of Bang Bang Bang!. The ladies love that mane. I suspect he’s the mysterious bad boy of the group, as he’s not as dementedly stage-hogging as the singer. Luca Martine by Whines, see the full size version on Furaffinity! Luca is the lead singer of Bang Bang Bang, high on life and Pulse Kool-aid. He’s competitive, athletic, bioluminescent, and I think the pretty boy of the group and the airhead of the party. He also has deep pockets in those tight jeans, and the party probably keeps him around for his expense account. Played by Corbeau. 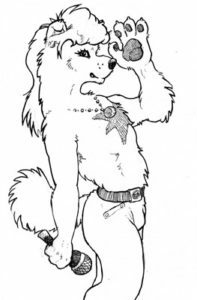 Zelik Kokoschka by Whines, see the full-sized image on FA! Zelik, played by Ashtaar, is the roadie, techie, and keyboard/effects guy for the band, providing most of the flash and quite a bit of the glam. He has a Mysterious Past and big wings. Ayo Onobanjo by Whines, check out the original on FA! 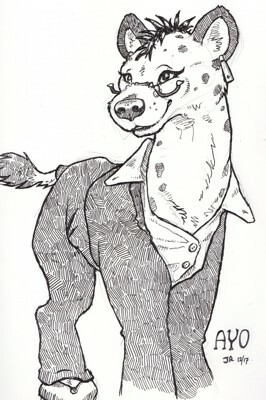 Ayo Onobanjo is the band’s manager, an organized and somewhat professional lateral hyena made loosely on a Nancy Drew template. I’d say she’s the common sense element of the party, but since she’s with the band, this is logically a false statement. ♃ 2.15 — For more information on Project Blueskies, check out the info page and list of known Kickstarter-generated space objects! ♃ 7.43 — First die roll of the session! The current version of 2.0 is using a very different, and simpler, dice system. While it uses the same general character sheet concepts (stat die, stat size, skill points…) it’s two dice results, added together, with some modifiers. This is a pretty clean solution, and it has a nice bell curve, too. Fundamentally each roll is: (Stat Die: D8 if you’re crap, D10 mostly, D12 if you’re unusually good) + proficiency die (D8 if you’re cursed or having a really bad day, D10 mostly, D12 in selected circumstances). To the stat die, your total scores in the stat in question and proficiency in question (so…around 1-3+1-3 for a starting character, and then a bonus for tools, gear, equipment, awesome clothes, and a bit of a circumstance bonus as well. 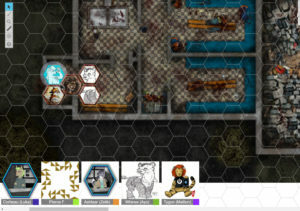 For the most part I deleted the majority of people mumbling over their rolls, but you can see that, the die rolls, text-based chatter, and a lot of vague hemming and hawing on HSDTV (part 1, part 2) When someone talks about a “boon” or a “simplify,” they’re raising one of those D10s to a D12. ♃ 11.44 — Whines will probably have a long moment about the challenges of playing out engrained cultural prejudice in a game. Laterals have a social “ding” because they just don’t fit in, but it’s hard to reflect this sort of game-stat-modifier stuff in a realistic culture. He also will likely talk about anyone being put off by being sniffed in 700AE. ♃ 21.22 — Around about this time Luka was getting ready to leap in front of the crowd to get extra witness testimony with a rousing cover of “HEY YOU!! (Why don’t you get a clue! ?”) but the party wanted to go subterranean. If I don’t get to play glam musician at least once next time I’m going to be extra pouty. ♃ 25.53 — For a sense of scale, the characters are on a Bluesky Station, these are very large craft, each at least five miles or so across: space stations the size of a small city. And there’s not many of them, maybe fourteen or so in canon. As expensive and glamorous places to live, not everybody’s been on one, and fewer have dug around in the catacombs underneath…#thiswouldbeagreatplacetogetmurdered More thoughts about bluesky design next episode. ♃ 26.52 — Well, that makes sense…in Sev’s head-canon, at least this runthrough, he suggests that there isn’t a “one world internet,” because that wouldn’t have survived Sol’s “Free Market” system…and, really, ours either. I’m not sure I agree, since a universal internet system is such a great sales tool, and the ubiquitous buyspots and toggles and such suggest that SolNet is pretty robust. Hmm. ♃ 31.59 — Here, Sev specifically describes at least the “Bastion” Bluesky as “a five mile cylinder.” This suggests, like Gavinfoxx was discussing in the HSD Discord Channel, that it’s very likely a Bluesky is modeled after the O’Neill Cylinder, which is a tumbling pair of cylinders each spinning a different direction to prevent tumbling, centrifugal force providing the gravity, and a central column of no-gravity floatspace. This matches pretty well with what we play through in the next episode. ♃ 36.00 — a brief digression on how critical successes and failures work in this edition of the system. ♃ 36.37 — Somewhere around here we break out of the halls of this particular dungeon and move into a large warehouse. Of course, given the scope of the hallways and spaces down here, the warehouse might have just been another part of hallway. These are potentially very large halls. ♃ 57.17 — Beginning the first combat session of the game, as the maintenance bot descends from the roof. Initial phase is initiative, but also the new “shape the battle field with your Initiative points” for super-swashbuckly characters. at 1.00.03 or so Tygon adds an exploding barrel to the grid. ♃ 1.02.00 — “solo” monsters get a second action each round, to help balance out the massive number of actions the PCs will likely unleash on it, and to keep combat moving. Worth knowing. ♃ 1.06.03 — Sev and Tygon go through the mechanics of a ranged attack. For most of the later die rolls I’ve deleted the chatter, because it’s a lot of mumbling over numbers, but for the first few I kept the conversation. ♃ 1.49.30 — And the end of combat! The score: A massive welding laser strike from the ‘bot has incapacitated Zelik, who’s crushed under some rubble. He’s got a broken leg, so the party argues about who gets to carry him back and who gets the photo op. The bot is broken, and its hard drive pulled for Evidence. With thanks to Whines, our audio engineer!